Our shoes are custom made and couriered to our customers so our shoe manufacturing and shipping costs are higher than other shoe retailers. Even with those higher costs we've priced our shoes at a similar point to other shoe retailers selling similar quality shoes so our margins at full price are lower than other shoe retailers. We peg this back by not holding stock and not having to discount excess stock that wouldn't otherwise sell. A normal shoe retailer needs to factor into their margins selling a percentage of their stock at a discount, which we don't need to do. So overall we think our margins are similar to other shoe retailers. Another reason we don't want to discount our shoes is we're very conscious of what it can do to a fashion brand. In amongst a number of branding traits we think Shoes of Prey sits as a slightly higher than mid level fashion brand. With a drop in retail spend following the global financial crisis a number of fashion retailers, in particular Myer and David Jones, responded with lots of sales. Unfortunately for them they've now trained their customers to shop when the sales are on and they're having a hard time pulling back from that. This has had an impact on other fashion retailers who then have to follow the lead of Myer and David Jones otherwise their sales drop too. I'm sure we're impacted by that to an extent, but given we have a unique product we think we have an opportunity to set the tone for our own pricing, and we've gone with one consistent price with no discounting. The alternative would be to set a higher standard price, then occasionally run sales at a lower price with the aim of averaging out at our current margin. We don't like that from a manufacturing point of view because it's better for our suppliers that our orders are steady each week, and we don't like how it trains customers to think about us from a price point of view and buying when sales are on as opposed to thinking about us from a fashion point of view, buying shoes to go with their spring racing season outfits etc. It's interesting seeing how other retailers deal with this issue. In the supermarket space Woolworths and Coles go with high/low pricing while Aldi has standard prices. Most low to mid end fashion brands take the high/low approach but this becomes less prevalent as you move up the spectrum to the more high end fashion retailers. Clearly there's no simple, correct answer to the best way to price your product and manage margins, but at this stage we're happy with the approach we're taking. I'd be interested to hear people's thoughts. You're spot on about avoiding the perilous drug of discounting. Stay the path! Shapes is still flogged at 99c a decade on, we all know to wait 4 weeks until the next price discount at Woolworths and Coles....the brand means less as a result. You have something valuable and unique to offer to people in Shoes of Prey. Don't go second guessing yourself. There are other ways of rewarding customers that still build your business. Haha, I have the same shopping habits at Woolworths and Coles. Most of my grocery basket goes on sale around once a month so it's a no brainer to just buy a bit more of it each time it's on sale. I suppose one advantage of that method is that for price conscious shoppers like myself, by going on sale once a month they keep me shopping at Woolworths rather than going to somewhere like Aldi where everything is about the same as the Woolworths/Coles sale prices. Instead, I keep going to Woolworths and just buy my main items when they go on sale, and of course a lot of things I do have to buy at full price. And in addition to keeping me as a customer, they get to sell most of their product at full price to customers who are less price conscious and don't bother shopping when products are discounted. So it's arguably not a bad strategy for them. That said, I don't think the same logic applies to us for the reasons outlined in our post and your comment Mildycurious. btw the soon to be launched costco will blow them away on cost. Myer had the pricing/discounting problem for a long time since their US CEO Dawn Robertson adopted a strategy of creating an impression that a sale was on all the time and that backfired. I don't think you should discount Shoes of Prey either if you are positioning yourself as a premium brand. You don't see Ferrarri or LV discounting! I think it depends on what you are trying to achieve. If your trying to build a premium brand and potentially expand it into other categories (e.g. handbags - my wife's suggestion) in the future then I think you have to stay the course. The CEO of Oroton Group, Sally Macdonald, is a stand out amongst the current CEO's of listed retailers. She has done an excellent job of repositioning the brand, eradicating discounting and investing in store re-fits that reflect the new direction. As a result of that they are now setting their sights legitimately on Asia. That represents a huge opportunity if they can continue to execute like they have. Your perception of Aldi is interesting. I go to Aldi to buy my son organic milk every couple of weeks. They have a large organic range and their pistachio nuts etc are actually not cheap. I don't buy any of their other food because I don't trust 'dodgy' brands. This is a very interesting discussion. Obviously you are keeping your costs as low as possible by manufacturing in China. One thing Boost Juice does does is give you a free drink on your birthday. I think that's nice. InspiredWorlds - the expansion of Costco will be very interesting in the grocery space. Their pricing, at least in the US is amazing and their quality in my mind is on a par with Woolies and Coles. Also their membership structure locks people into buying from them. Apparently their big issue in Australia is finding the right properties, as we don't have a lot of big box retail zoning, but hopefully they can find some good locations. Gus - I've not read much about The Oroton Group. That's a very clever strategy to use store fitouts to mark a change in the consumers mind that the brand has changed, so they continue to shop there even though the sales have slowed down or stopped. Myer and David Jones should take a leaf out of that book. Frances - From what I understand of Aldi, the brands they stock, while being house labels that aren't stocked elsewhere, are actually manufactured by many of the same people as the popular brands. Certainly their strategy is that the brands they stock are to be on par quality wise with the popular brands and in my experience they are. Part of Woolies and Coles move to stocking a lot more house brands is to counter this move by Aldi, and I think the Woolies and Coles house brands are also on a par quality wise with the popular brands. In regards to our costs, the choice to manufacture in China was because for the suppliers we found there we felt that have the optimal combination of quality and price. The quality is incredibly good, better than many other manufacturers we've seen in Australia or Europe, they can do custom shoes, and the cost allows us to price at the point we do, which is on a par with other high quality brands in Australia, but a lot less than custom shoes are from your local shoe maker in Australia and a lot less than the top end brands. We could manufacture at probably half our current costs if we wanted to, from other suppliers in China or other parts of Asia, but we wouldn't be happy with the quality, and to be honest we didn't actually find any suppliers willing to do custom shoes in Australia or Europe so I'm not even sure that would be an option for us. The Boost Juice idea for a birthday gift is a good one. A very interesting post and one that has certainly got a lot of people (myself included) wanting to comment! I agree with your strategy as it is one that I hold myself for Grace & Audrey. It is a difficult decision to make when everyone else is going on sale but I do agree that if you have a premium product, you don't want to destroy the brand with random sales for no reason. Similarly to yourselves, I have opted to work on low margin in order to give the best product I can at the best price. Also to note, in addition to my Grace & Audrey business, I have worked in the mid-priced fashion shoe industry for many years and can confirm that the quality from good suppliers is really getting better and better out of China all the time. I manufacture my clothing in Australia for a variety of reasons, partly quality control but mostly to give me an edge and point of difference in a challenging market. This doesn't mean I would ever say that the Chinese do not make amazing clothing and footwear in the right factories. Was lovely to meet your team today and thanks for your latest post on the PayPal Insights Events. I don't usually comment on blogs but you and your readers got me excited on the pricing and retail topics! 2) Yes, price promo will generate spikes, but then as everyone pointed out, it's like becoming a drug addict, once you've done it, you can't stop if you want to show year on year growth. At the same time I'm surprised your business is not seasonal i.e. 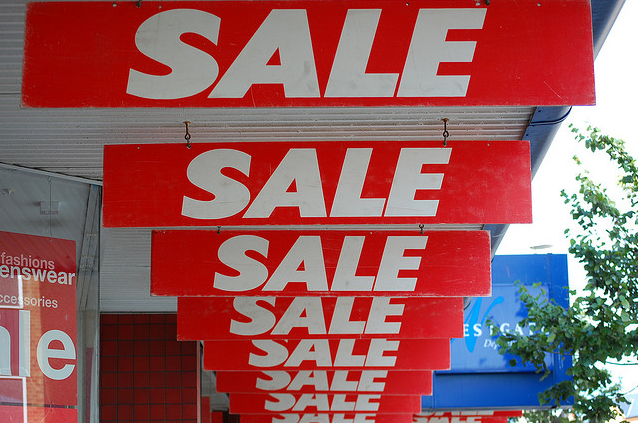 you can maintain steady orders all year round, without needing a sale to iron out quieter period? 4) Aldi and Wollies/ Coles home brands: these are the most profitable line of products. Indeed big FMCG brands include their marketing and advertising expense in their wholesale prices, which makes retailers margin much smaller, but they have to carry those brand anyway. That's the power of brand (who can do without a stock of Coke). In France, supermarkets' home brands account for a much bigger % of their turnover (and therefore help improve their bottom line big time) because their design and features look like big brands. Wollies started making progress with the "select" sub brand with nicer packaging as opposed to the awful red and black home brand. Last thing I want to say is that I really appreciate how open you are about your business, both to your consumers but also to other start up companies. This is very brave and shows how much integrity you have. Respect! Hi Thien-Lan thanks for your lovely comments and it was great to meet you on Wednesday too. Regarding seasonality, that's a very good point, it will likely pan out that there will be seasonality in our business and perhaps some sort of discounting could be good to smooth out volumes at that point. For now though, any seasonality is obscured by our growth, our sales have doubled every quarter since our launch. Unfortunately that won't keep up though so you're totally right, we could consider discounting at that point. Another option for us might be to increase production of our ready made shoes during quieter custom shoe periods. I guess we'll cross that bridge when we come to it, but thanks for speaking that thought in our minds! Barriers to entry is an interesting point. There are some, manufacturing high quality custom shoes is difficult and not many people can or will do it. And building a good online shoe designer is also a difficult task. That said, neither of those things are impossible so we may well see more competitors enter the market putting pressure on pricing in the future. That's interesting that house brands are much stronger in France than Australia. Regarding being open about our business on this blog, the benefits definitely run both ways. We love sharing and the fact that other people what we write interesting. But we also take a lot of benefits from the blog too. Thoughts like the seasonality one you mention above are a perfect example. We've also blogged about some of the benefits here: http://www.22michaels.com/2009/11/value-of-blogging.html and here: http://www.22michaels.com/2010/07/14-months-of-blogging-on-22michaels.html More businesses should do it! As an online retailer who holds stock and operates in seasonal industry (cycling), I have been tempted on several occasions to conduct sales of stock. 1. I sell unique products which are mostly exclusive to CycleStyle in Australia. If you want the product, you have to buy them from me (I keep prices on par with international retailers + shipping to Australia). I also try to keep prices on par with (less stylish and unique) substitutes. 2. I don't want to start training my customers to wait for a sale before purchasing. I too have watched the Myer/David Jones dynamic with interest and these days as a consumer I don't ever buy anything from those stores unless they're on sale - because I know if I wait long enough it'll be discounted. 3. I've read somewhere that it's not about the price you charge, it's the perceived value you project. That's why people will buy a $3000 handbag instead of a $300 handbag. Partly it's quality of workmanship, but a lot of it is about the perceived value of owning say a name brand, or a unique design, or bearing a status symbol. 4. At the moment I only discount if I think the customer will give me some sort of return - either profile (through their social media connections) or turning a negative outcome into positive word of mouth (eg if we're out of stock of their item but they've still managed to purchase it due to a glitch in our ecommerce system). Hi Joyce fantastic thoughts. I checked out your site and I really love your products, they're definitely unique and it's a good entry into the cycling market. There are so many cycle online retail stores opening at the moment, (including some that do custom coloured fixies!) so I think you're in a good position to be taking advantage of that trend, with accessories rather than bikes. In addition to your range being unique, I think it's well priced too. Totally agree with all your comments, thank you for sharing! I own an ecommerce site for handbags & accessories and am constantly trying to work out pricing, margins - to have a sale or discount etc. I have in the past created sales but haven't seen a lift in numbers. The same styles that i've carried for some time will sell at the higher price later on. So i've discovered that i really don't need to have them. Having realistic pricing is what my site is about and what i promote. As a previous post said it is about perception and the value people feel they are getting. I am now looking to incorporating repeat business and rewarding existing customers. Along with referrals. It costs much more to win new business than to upsell your existing base. I offer a $10.00 discount to customers for signing up to my newsletter & offer a discount coupon in each purchase to encourage repeat business. I know there is heaps more i can do, i'm just trying to find my feet (still) with the world of online selling & the competition.